Although I wrote everything I know about squirrel issues for this website, oftentimes a problem with squirrels in the attic is beyond the scope of the do-it-yourself homeowner to solve. I have found a professional company in Bradenton, Florida that handles problems with wildlife. Trutech Wildlife Services has access to tools, techniques, and experience that help them do a far better job at wildlife removal than a non-experienced homeowner could. They possess licensing that allows them to do certain types of work legally, that non-licensed homeowners in the state of Florida are not allowed to do. For the welfare of your situation, and the squirrels, in some cases it's best to hire a pro. There are good companies and bad companies out there. I've done research on such companies, to get to know them, and feel confident recommending their services. I therefore recommend a company called Trutech Wildlife Services which services Bradenton, Florida. If you have a squirrel problem, or any other conflict with a wild animal, and live in Bradenton, I am confident that this company, Trutech Wildlife Services, is the one to call. I asked the company to describe their service range, and they said this - We also service Sarasota of course. Our range includes most of the south end of Tampa Bay, including Palmetto, Memphis, Ellenton, Oneco, Whitfield Estates, Bayshore Gardens, Cortez, Holmes Beach, Anna Maria, and Palma Sola. Trutech Wildlife Services operates 24/7, so don't hesitate to call at any time to discuss your wildlife problem, and schedule an appointment for same-day or next-day service. Nope, a trap set inside the attic definitely will not trap the squirrel. Your odds of finding a nest and removing the babies by hand is very low. If you do, send me photos! Any thick leather glove will do. I would wait for the young to grow larger, then exclude or trap them all outside, and seal the hole. Hi I opened my door and noticed a little rodent hoping all over my table in the dark (it was night), on close observation with a torch light I discovered its a small squirrel, I didn't feel like killing it cos I like squirrels and I tot its a baby. The next night yl on my bed I heard noisen, pointed a torch light and saw two of them this time. Now I'm scared it gives me goose pimple knowing I have squirrels all over my room and they're not ready to leave. Pls what shud I do and which kind of baby squirrels are not scared of living together with a man? If you have a squirrel problem in Manatee County Florida, or any other conflict with a wild animal, I am confident that we can solve it. 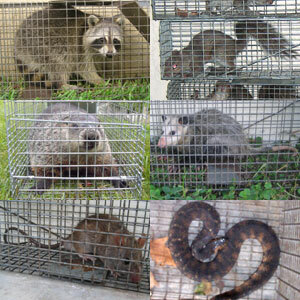 We use humane methods when dealing with Bradenton wildlife removal situations. Squirrel Control Bradenton. Our company is fully licensed and insured in Florida. Call us any time at 941-209-1474 for a price quote and to schedule a same-day or next-day appointment to solve your squirrel problem in Bradenton.